Protecting your home from possible burglaries or even home invasions is something the head of the household always thinks about. Home security and thinking about the different ways to keep loved ones safe is at the forefront of every homeowner’s mind. This fact may shock you, but for every thirteen seconds, there is one burglary that takes place. There are several options you can take to ensure your house remains secure and installing a comprehensive security system is one of the best solutions available today. For every three homes without a security system at least one falls victim to thieves. By adding a security system to your home, that number drastically improves. Only one out of two hundred fifty homes with a security system get burglarised. 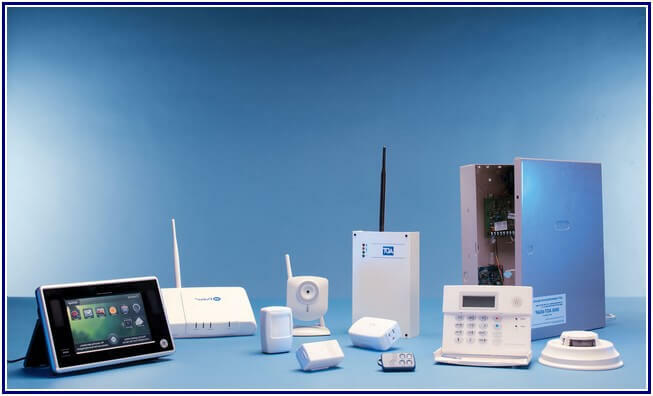 Home security systems are comprised of a network of security devices that serve individual functions. Each tool handles certain aspects that are vital in a home security system. There are many different devices that you can integrate to work together. Other than giving your peace of mind and deterring thieves, adding a home security system will even lower your home insurance premiums. A staple in any home security system, you can attach door sensors to as many doors as you want. The door sensors will notify you via your smartphone about each door being opened. It is essential to have these sensors attached to the main entrances of your home. You can also add the door sensors to any other room that you want to get a notification on. Maybe the master’s bedroom or even your closet where you keep the safe. Window sensors work the same way and will alert you if and when a window is opened. Never get locked out of your home again with a Bluetooth lock. It installs to your current deadbolt lock within minutes, and you can control the lock from your smartphone. Control who goes in and out of your home with the app, batteries for this type of device usually lasts several years. If you forgot your phone somewhere, you could still use your regular keys to get into your home. Fingerprint locks are also gaining popularity for the high level of security they provide. Program into the smart lock all the fingerprints that you want to have access to your home. Fingerprint locks also come with a numeric keypad so you can enable a two-step verification process for even more security. Home monitoring kits are an excellent shortcut to automating your home. The latest trend in home automation allows you to automate your home wirelessly. There are kits that you can install yourself in a matter of minutes. Setting this up will give you the ability to monitor your home remotely. You can then even control the lights, electronics and various appliances in your home. Research on what home monitoring kit is best for you, some also come with temperature, smoke and even moisture sensors. Most of us are familiar with the backyard lights that activate on when there is some movement in the backyard or lawn. This is possible because motion sensors are integrated into the lights themselves. Motion sensors have more uses that just to turn on lights. Home security systems use motion sensors to alert homeowners of any tampering of personal property. Motions sensors can be positioned where your assets are located in your jewellery drawer or safe to inform you if anyone has even attempted to invade your privacy. Security cameras are a vital part of any home security system. Install and position cameras to keep an eye on things that matter to you in your home. Keeping a couple of cameras pointed at the entryways of your home at all times is a great place to start. It is also a good idea to have a couple of cameras on the lookout inside your home. It is up to you if you want to install the cameras in plain sight or to keep them hidden from view. Cameras will allow you to view the going on in and outside your home at all hours. Choose cameras that have night vision or infrared capabilities to be able to keep tabs on everything that goes on even at night. Integrating security cameras into your home security system will allow you to view everything from your smartphone no matter where you are. This comes standard in all home security systems. Get notified of a possible intruder or fire by the blaring siren of the alarm system. Now that you know about all the individual components that make up a home security system, you can start canvassing for the best one. Many different companies offer home security systems, choosing one can be a challenge. Make sure just to choose the type of equipment you need for your home; you can always add to that later as the need arises. Based on customer satisfaction and overall quality, these are the top three home security systems on the market today. Choose the best home security devices you would need to safeguard your home. Second, choose a company that can provide the equipment and services you need at the best deal you can get. Setting up a home security system in your home today will ensure you are securing your home and protecting your loved ones every day.